Originally known as Parer's Pavilion, The St Kilda Pavilion is a historic landmark which was built in 1904, and sits proudly welcoming any traveler willing to walk the planks, so to speak. In September 2003 the Pavilion was tragically burned to the ground after an arson attack, however the building was restored in March 2006. It was reconstructed using the original plans from 1904 and some parts that were salvaged from the original building. This image belongs to the travel and nature stock photo library. This stock photo of St Kilda Pavilion is available for licensing for commercial and editorial uses including websites, blogs, books, magazines, brochures and advertising. Restrictions may apply for images which contain third party copyrighted material or sensitive subjects. Photos of artwork are for editorial use only. 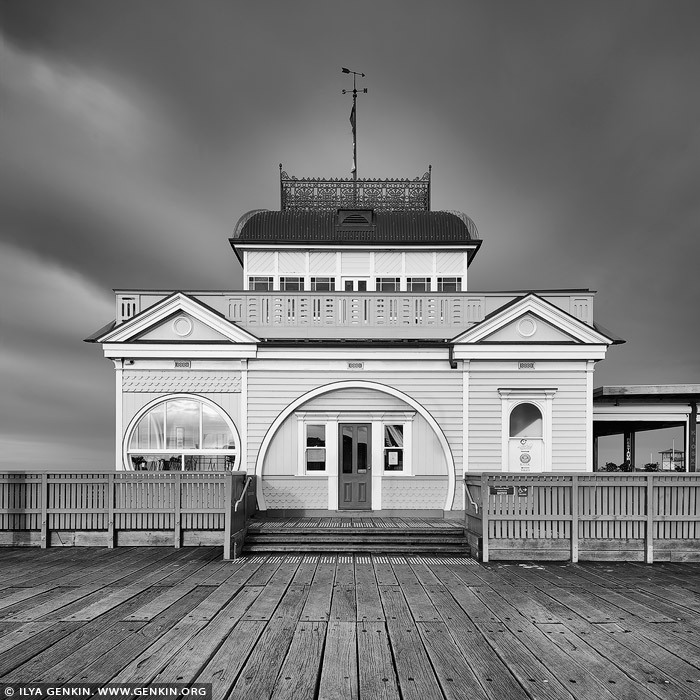 This image id AU-MELBOURNE-0009 of St Kilda Pavilion, is copyrighted © by Ilya Genkin. This is not a public domain image.